Two months down, 10 to go! 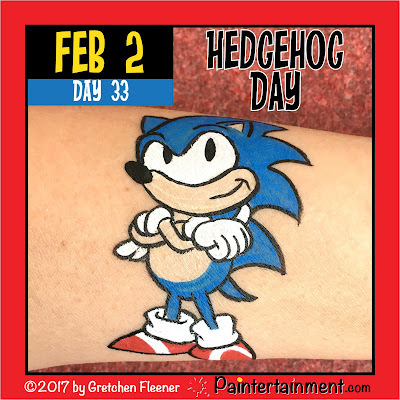 It's been another GREAT month of fun challenges as I continue to post a painting every day related to that particular day of celebration! 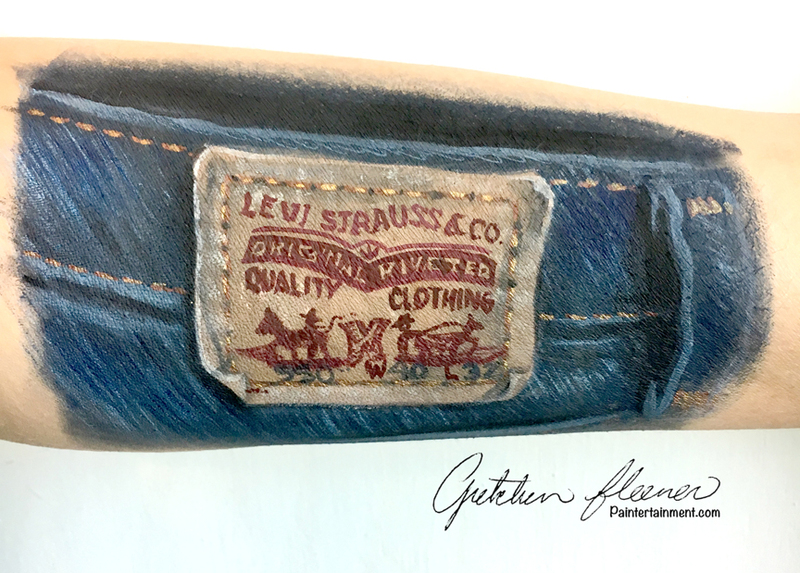 I had some cool fabric textures to paint again this month, including a fuzzy sweater, denim, and my first full shirt painting! 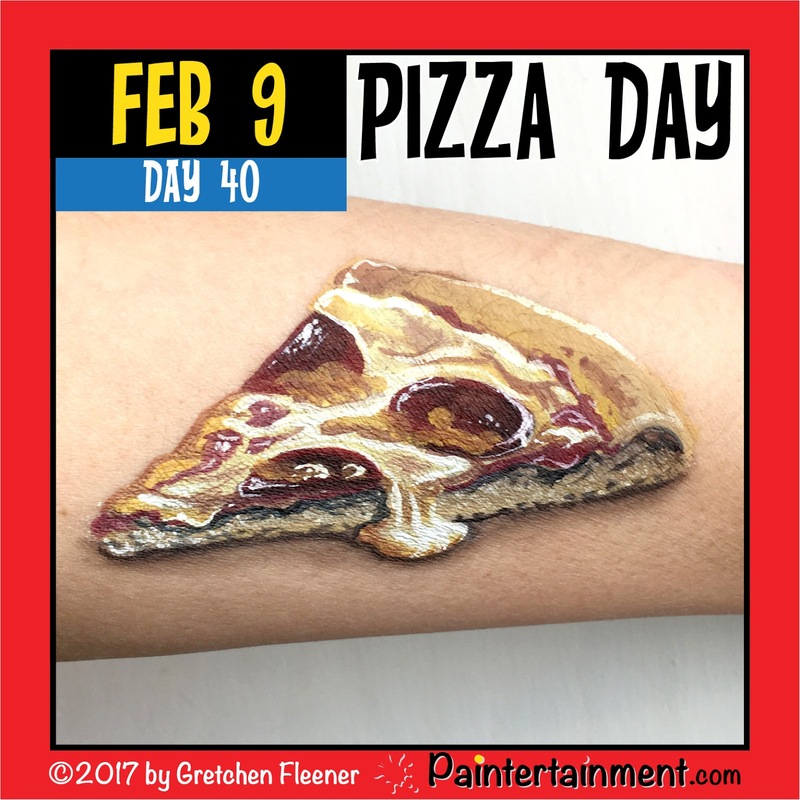 There were also a lot of fun food related themes, giving me opportunities to paint some unique textures...the foil wrapper and powdery finish of a stick of gum...greasy, melted cheese on a pizza, and the subtle contrasting tones of an Oreo cookie. What will March bring? Your guess is as good as mine! Thanks so much for stopping by! 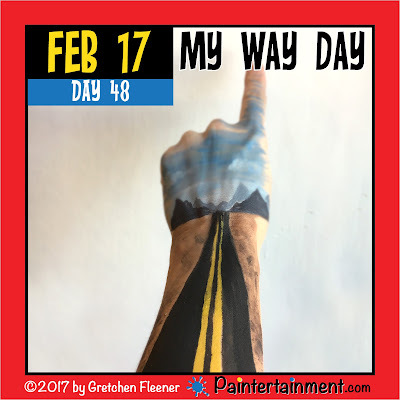 Don't forget to like Paintertainment on Facebook and subscribe to this blog to get my daily paintings delivered right to your inbox! 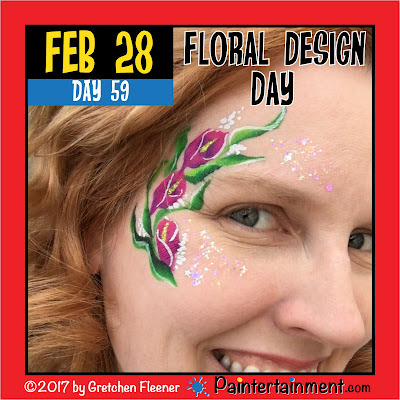 Celebrate Day 59: "Floral Design Day!" Happy Floral Design Day! I was planning on going way all out on this theme while hosting my paint jam, but I ended up being so busy, this was all I got painted for the day! I wanted to practice some one stroke kalla lilies. These turned out way better on my PainterTemplate than on myself, but oh well...I do like how simple and quick these are! 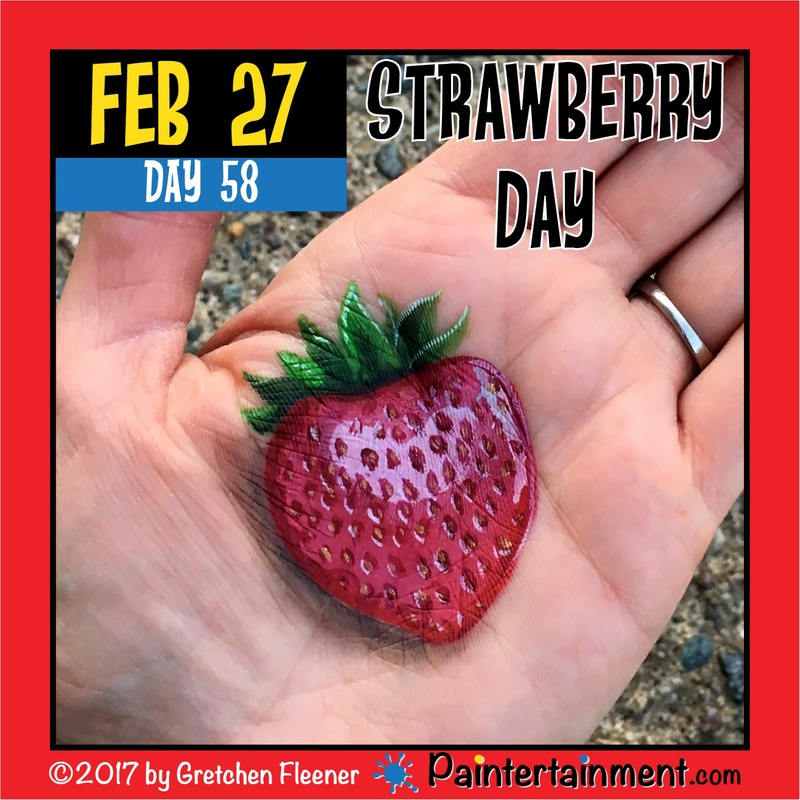 Celebrate Day 58: "Strawberry Day!" Happy Strawberry Day!! 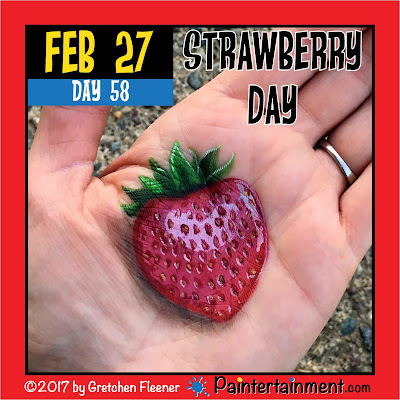 While I did already paint a strawberry for chocolate fondue day, I thought it would be fun to just try a strawberry itself this time, and used a different method to achieve the lighting and shadows on this one. This is one of those paintings that I thought didn't look great when I finished, until I later looked at the photos. One thing I always like to do in my workshops is encourage my students to always take photos of their work! They may hate it now, and then later look back and realize it was pretty good! 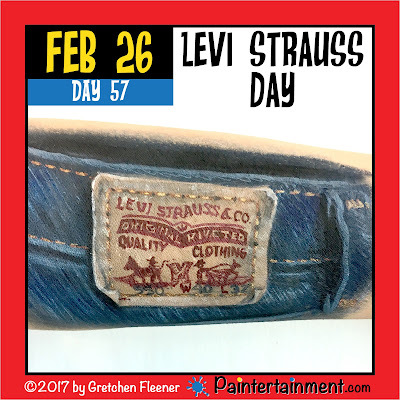 Celebrate Day 57: "Levi Strauss Day!" 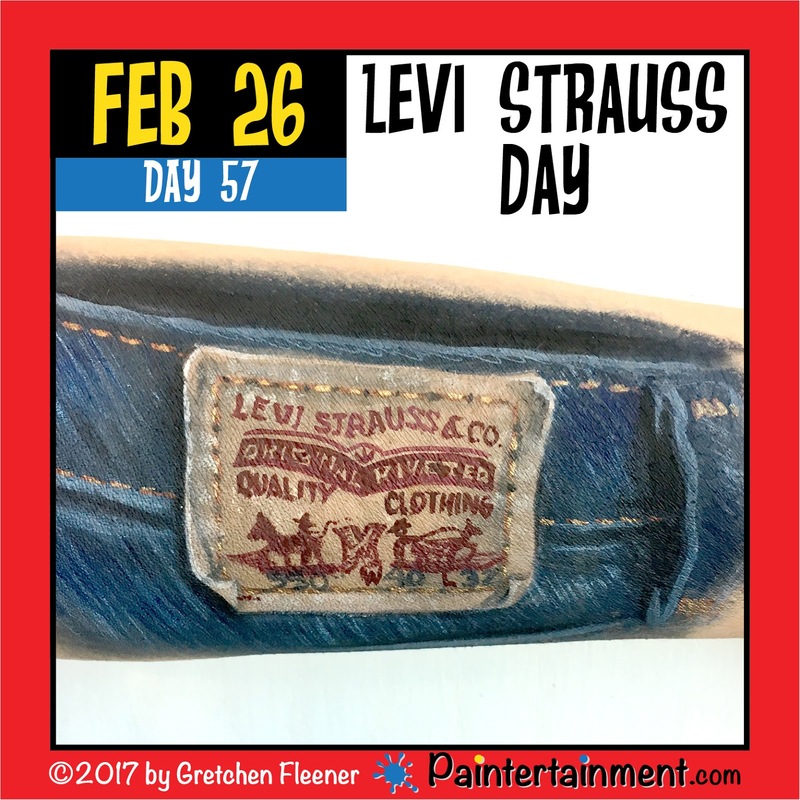 Today is Levi Strauss Day! Aaah, I SO would love to be able to paint a pair of jeans someday!! But for now, my arm will have to do! Looking for some tips for painting fabric? 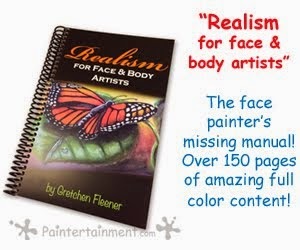 Check out my book, "Realism for Face and Body Artists!" 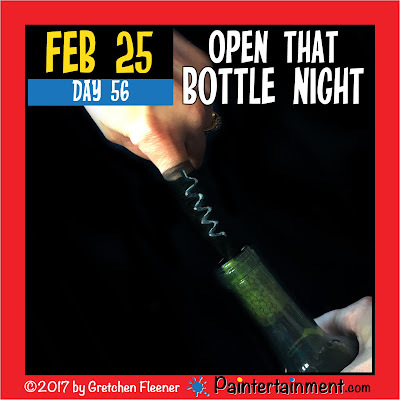 Celebrate Day 56: "Open That Bottle Night!" 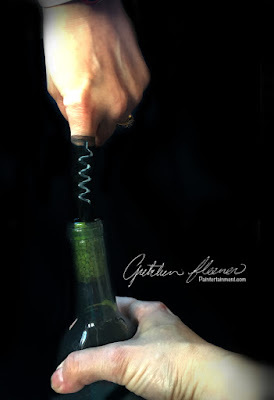 Here's a little corkscrew finger painting for you! Reminds me of the Swiss Army Knife painting I did a while back! Celebrate Day 55: "Tortilla Chip Day!" 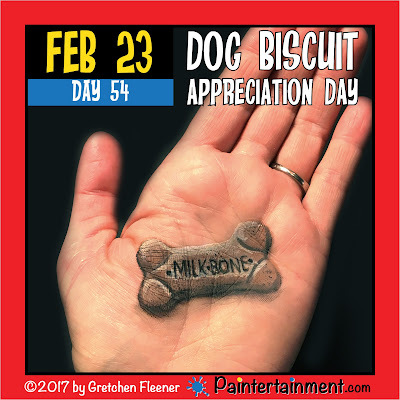 Celebrate Day 54: "Dog Biscuit Appreciation Day!" Are you feeling unappreciated lately? Well if you're a dog biscuit, you're in LUCK! Today is your day! I know at least one of my four legged family members reeeeeally appreciates you! Are you looking for ideas for a puppy themed birthday party? I had one of those for my son Sam and it was awesome! Here are some fun ideas! 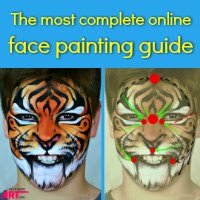 Why not add a professional face painter to the party too? 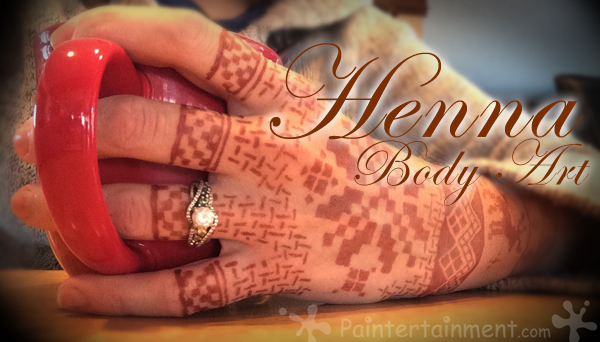 Contact Paintertainment and we can paint your party guests like adorable puppy dogs! 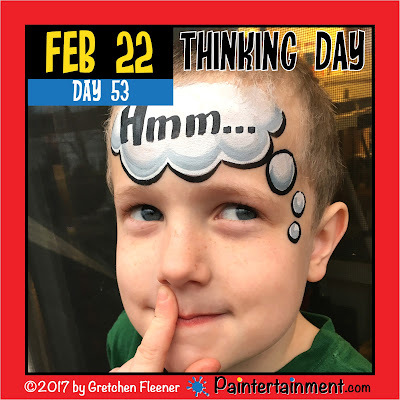 Celebrate Day 53: "Thinking Day!" Have you been putting off using your brain? Well today is the day to start using it! Today is thinking day! I admit I did have to do a little thinking to come up with the idea for today's painting, but luckily I had a willing participant when the idea struck...thank you, Toby! Are you racking your brain trying to think of a fun way to make your upcoming event extra fun and memorable for your guests? 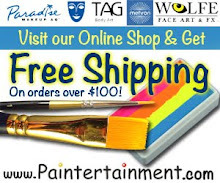 Contact Paintertainment today for high quality, reliable, and talented professional artists! Celebrate Day 52: "Sticky Bun Day!" 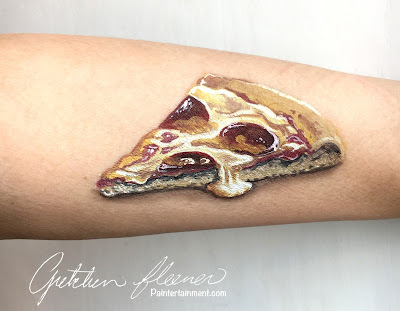 Looking for some quality face paints that don't leave your face feeling gross and sticky? 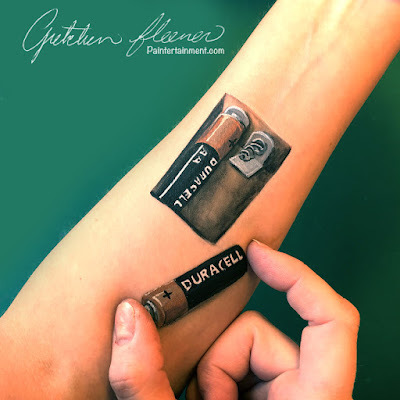 If you've experienced this problem, you haven't been using the professional, high quality theatrical makeup that is available now at Paintertainment! Check out our selection today! 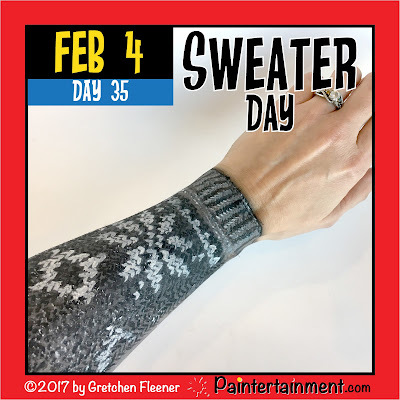 Celebrate Day 51: "Handcuff Day!" Today is Handcuff Day! 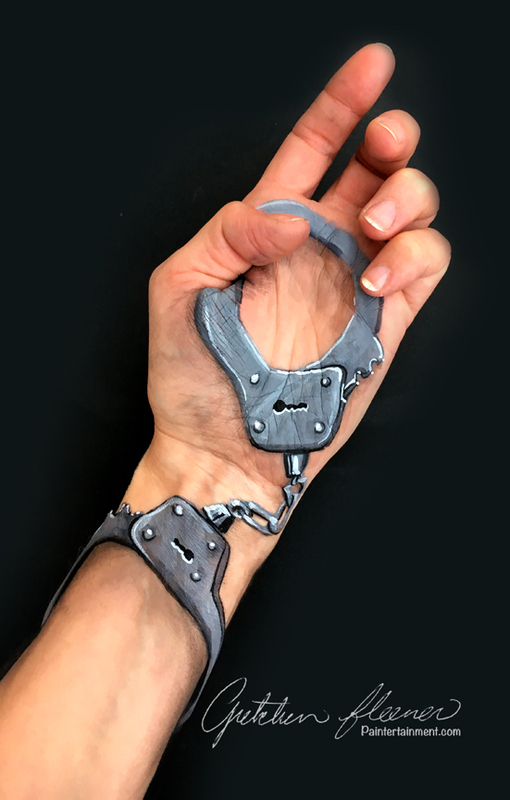 Luckily having two little boys in the house, we also have a set of toy handcuffs, which worked great for reference for today's painting! 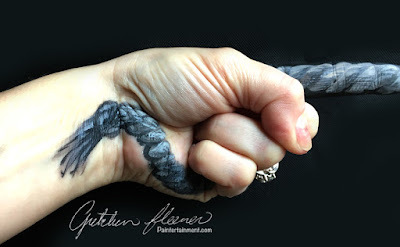 Feeling tied to the same old thing every year for your kids' birthday parties? 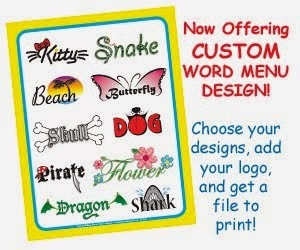 Free yourself of the ordinary, mundane party plans and hire a face painter or balloon twister!! 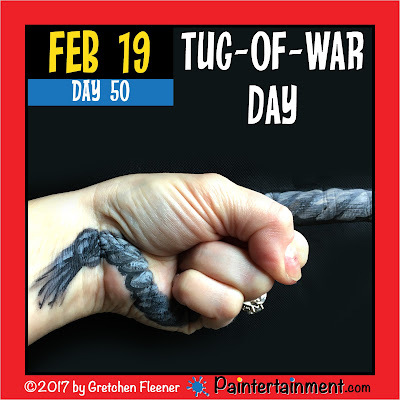 Celebrate Day 50: "Tug-of-War Day!" 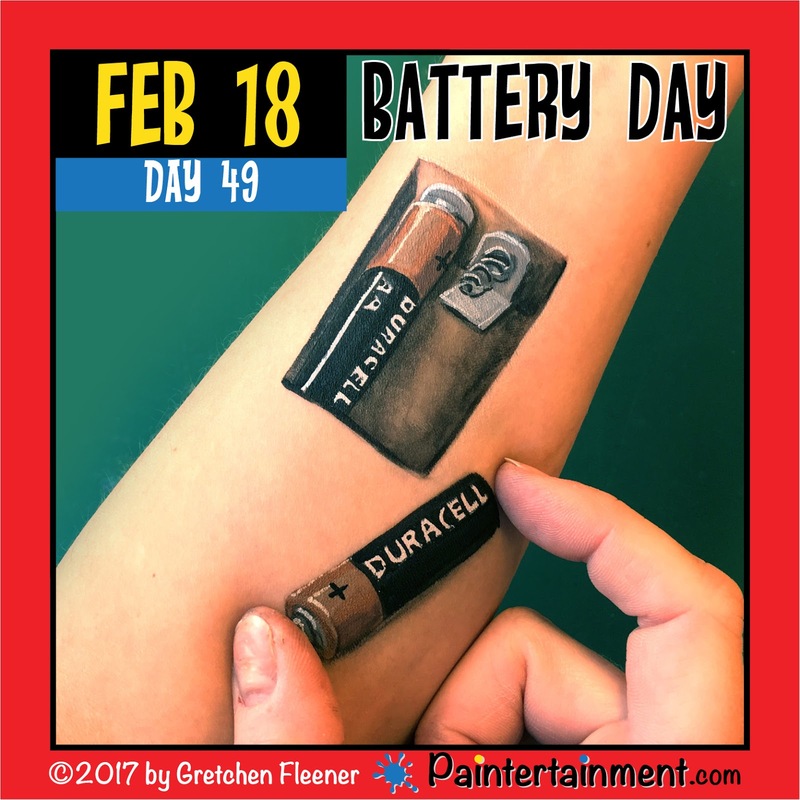 Celebrate Day 49: "Battery Day!" Want to treat your birthday child with something that doesn't require batteries or any storage space and never gets donated to Goodwill later? 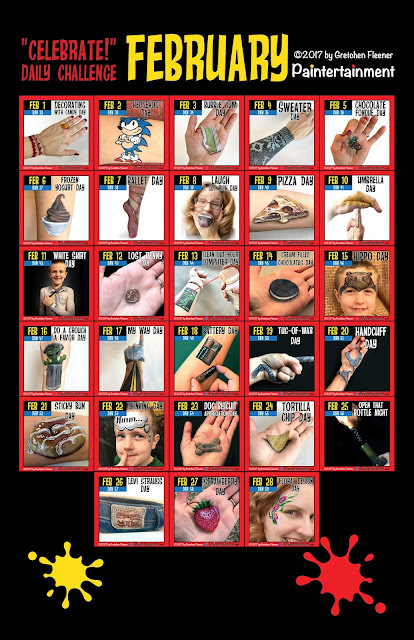 Get them a face painter, balloon twister, henna or glitter tattoo artist for their party! Celebrate Day 48: "My Way Day!" My way? Meh...I choose the HIGHWAY!! Celebrate Day 47: "Do a Grouch a Favor Day!" 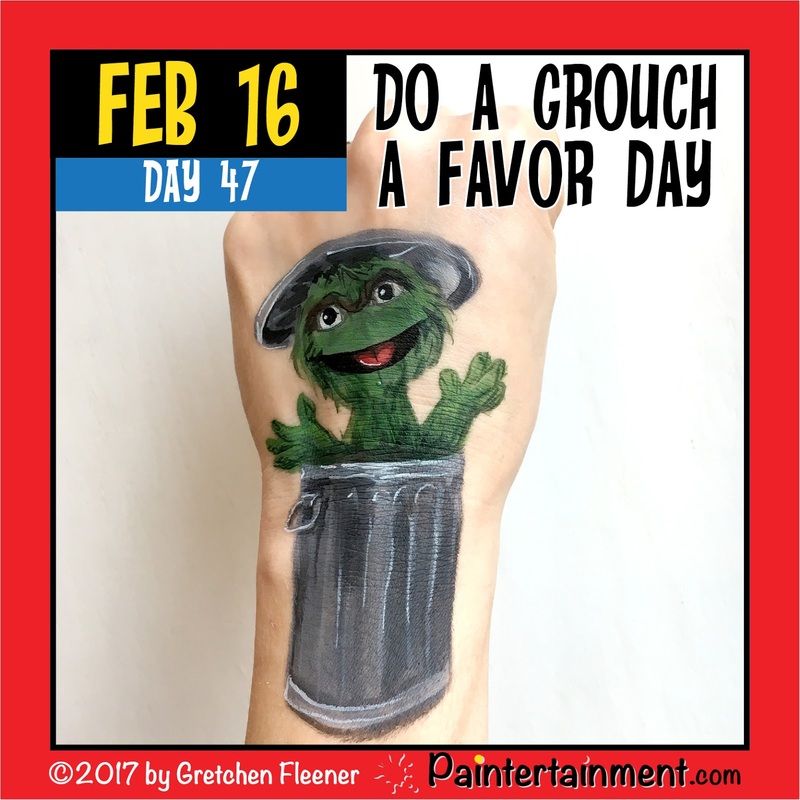 It's "do a grouch a favor day!" For today I of course had to paint one of the most well known grouches, Oscar! Believe it or not, I have actually received calls from clients requesting that we please provide them with a friendly face painter, because in previous years when they've hired through other companies, they have gotten GROUCHY artists who are not nice to the kids. Yes, it's true!! There are even people in THIS profession who do not like their jobs! Crazy, I know. 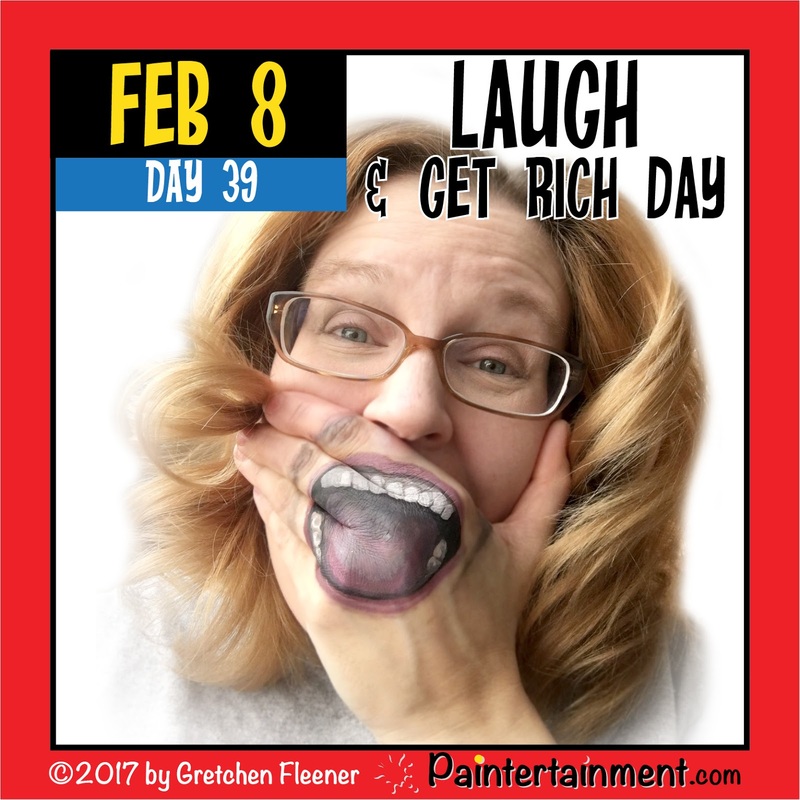 Grouchy entertainers make for funny Homey the Clown skits, but are not recommended for actual celebrations. These people really should find a new line of work, because our job is to bring joy to kids! Looking for someone who won't act like a total grump for your child's big day? 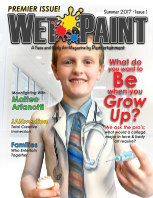 Contact Paintertainment for talented professionals who love their jobs, and it shows! 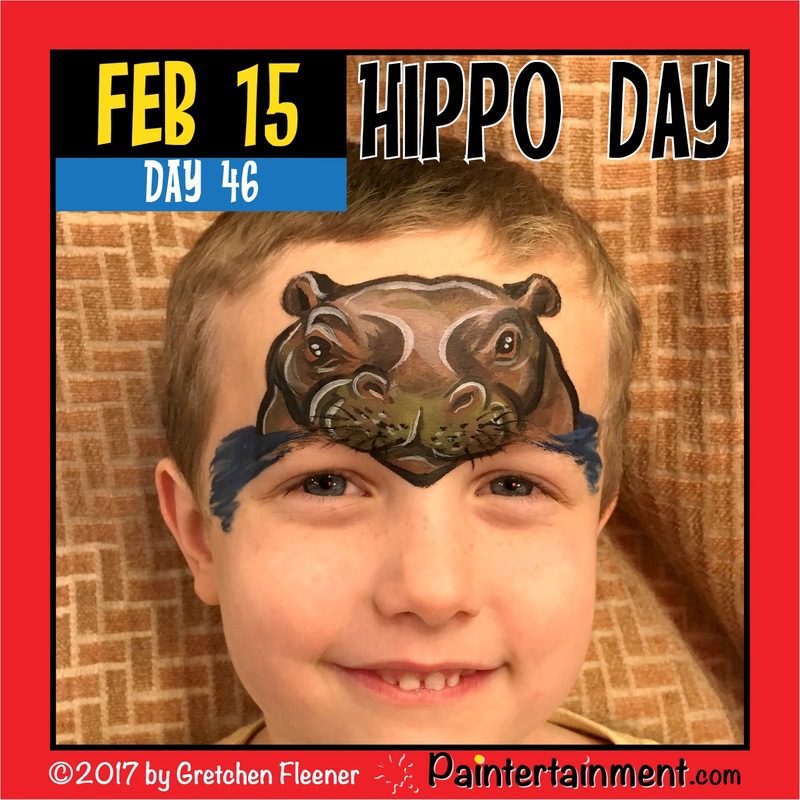 Celebrate Day 46: "Hippo Day!" Happy Hippo Day! I can honestly say I've never painted a hippo! So there you have it...my first ever hippo painting! 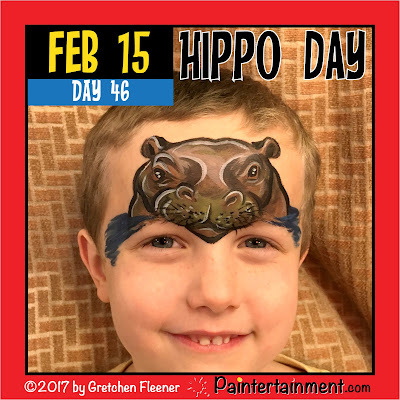 Toby and I had fun singing "I want a hippopotamus for Christmas" while I painted this one...haha! Celebrate Day 45: "Cream Filled Chocolates Day!" Don't have a valentine? That's okay! 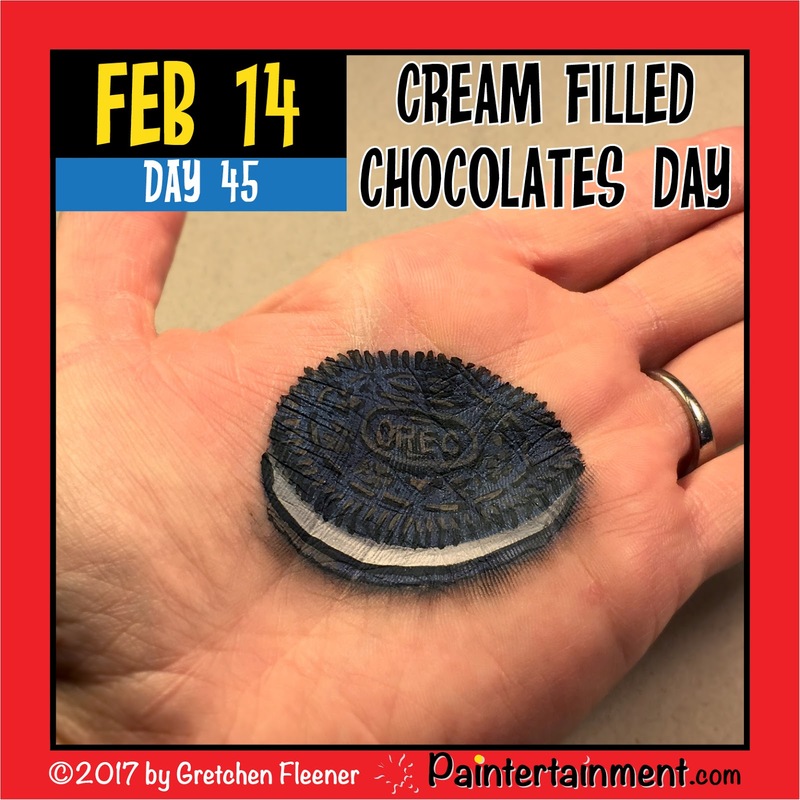 It's not the only holiday to celebrate today anyway...today is Cream Filled Chocolates Day!! Get out there and treat yourself to one of those heart shaped boxes of cream filled chocolates! Or better yet, inhale a package of Oreos over a good movie! 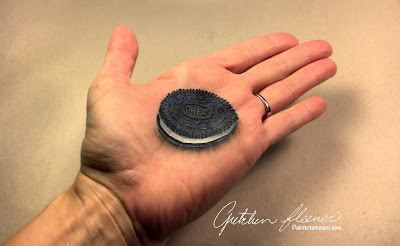 This one took a lot of subtle color differences to achieve the texture of an Oreo! When the light hits an Oreo just right, it has almost a metallic blueish color to it. So I started with a really dark brown mixed with a pearl blue! I then added the depth and highlights of the texture with shades of black and lighter browns. Mmm...you can almost taste it! Celebrate Day 44: "Clean Out Your Computer Day!" You've been putting it off, and now it's finally time! 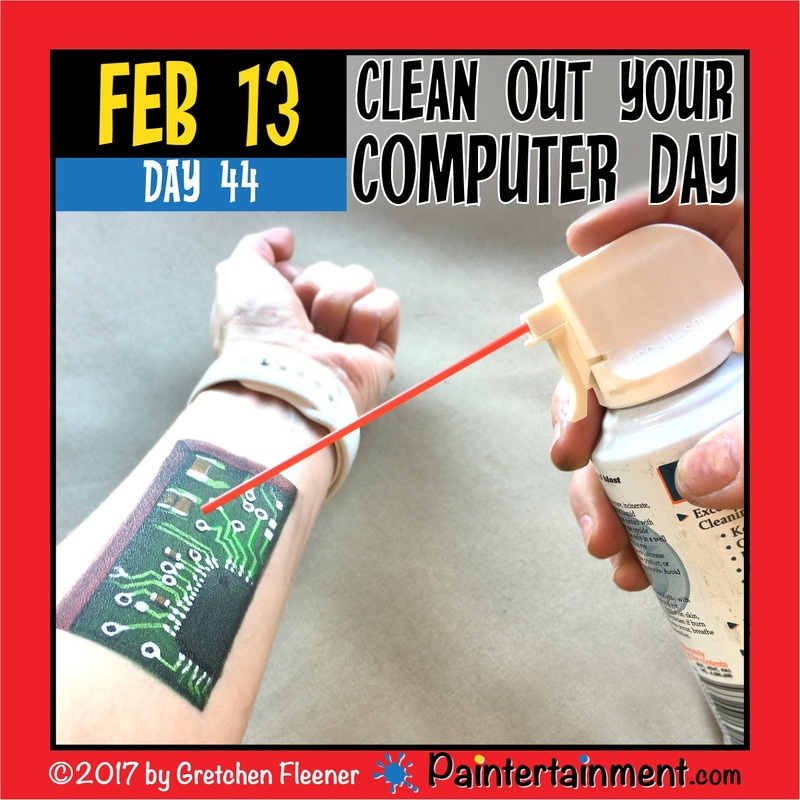 Celebrate today by cleaning out your computer! Whether you clean dust out of it out with a can of air or just delete unused files, I think all of our computers can use some tidying up now and then! 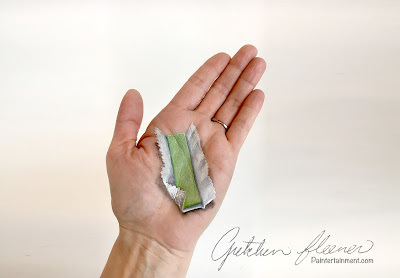 Looking for some good, "clean" fun for your upcoming party? Contact Paintertainment today! Celebrate Day 43: "Lost Penny Day!" 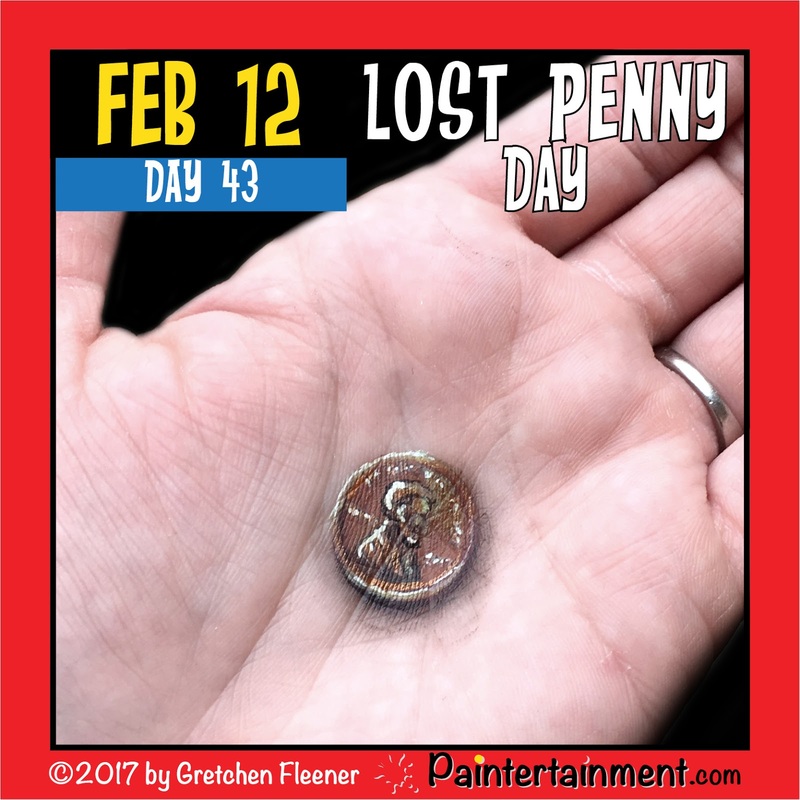 It's lost penny day! 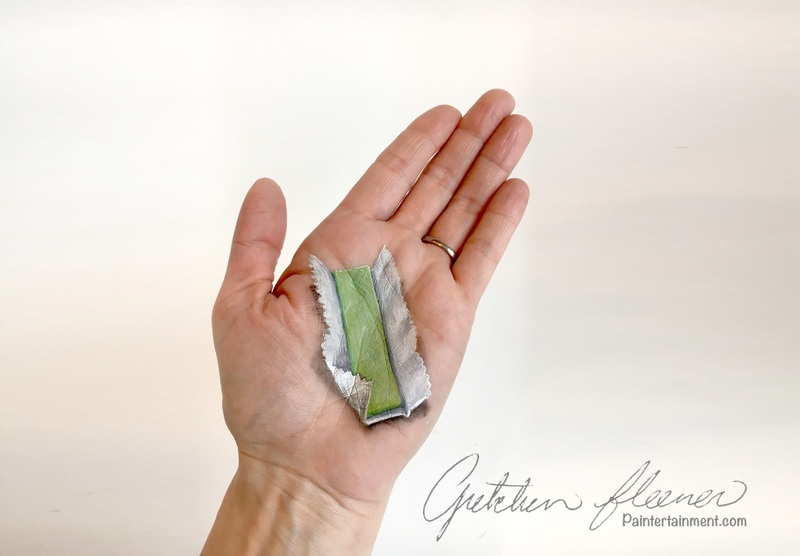 Today is the day to gather up all the lost pennies sprinkled around parking lots, between couch cushions and under car seats, and donate them to a worthy cause! 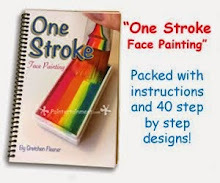 Are you a professional face painter looking to save a few pennies on your supplies? Check out our clearance section and our garage sale section! And for even bigger savings, you can subscribe to our free monthly e-newsletter with a coupon code in every issue! Speaking of free, we also have a TON of totally free resources that you can find here! Happy painting! Celebrate Day 42: "White Shirt Day!" 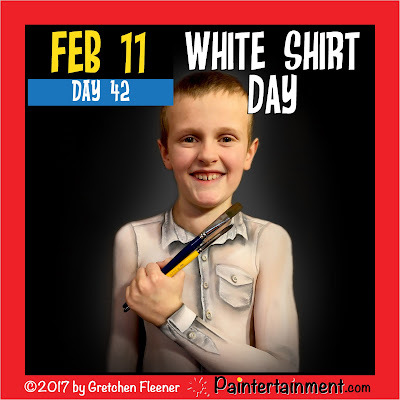 Happy White Shirt Day! 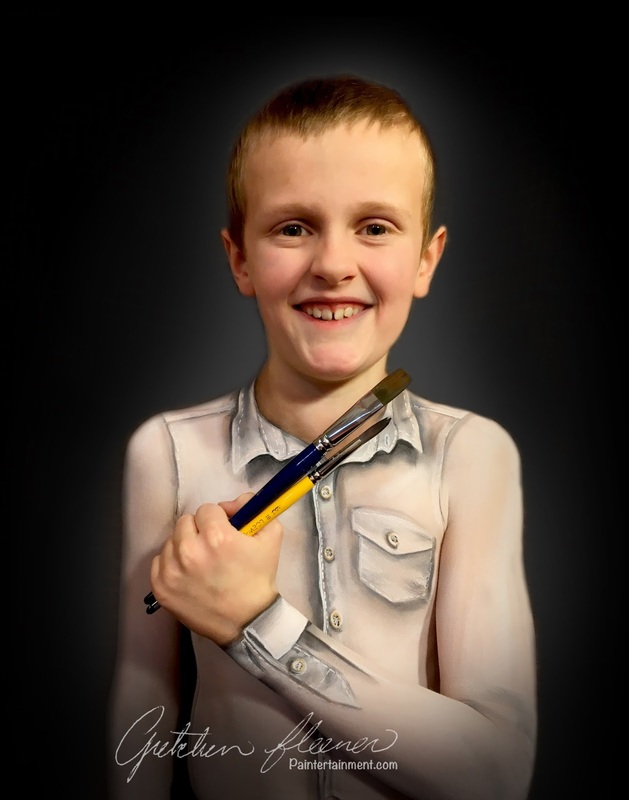 It took a few days of convincing before my main man 9 year old Sam agreed to be painted for this one, but once we got going he loved it! I'm wishing I had done a video as the giggles when the kabuki brush tickled were the BEST! Haha! Looking for a body painting of your own? Contact me today! 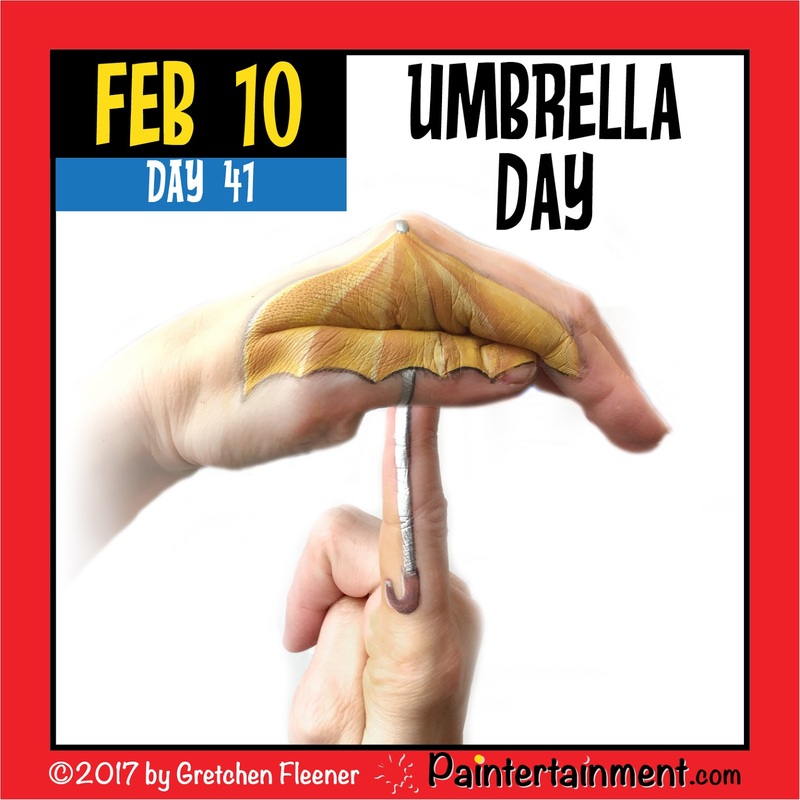 Celebrate Day 41: "Umbrella Day!" Well, today is apparently umbrella day! Unfortunately in February in Minnesota, we rarely need to use umbrellas for either rain or to shade us from the sun, as it is typically cold and dreary! But, today I can stare longingly at the calendar and count the days until April Showers come and bring May Flowers!! Got a party coming up and you need some activities that are just as fun indoors as outdoors? 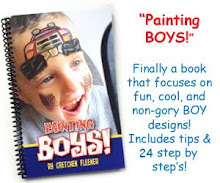 Face painting is the perfect thing for you! Contact us today to book your artist! 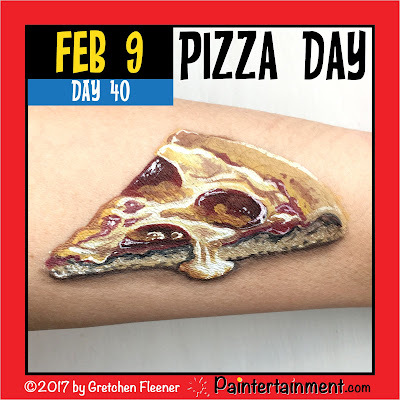 Celebrate Day 40: "Pizza Day!" Looking for some fun birthday party entertainment that fits in just perfectly between presents and pizza? 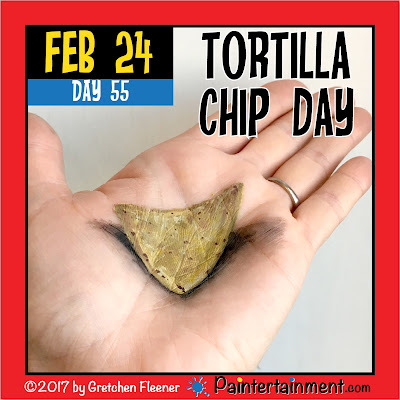 Contact Paintertainment! Celebrate Day 39: "Laugh & Get Rich Day!" Looking for someone to create some laughter and put smiles on the faces of your event guests? Hire artists who LOVE their job! Contact Paintertainment today! 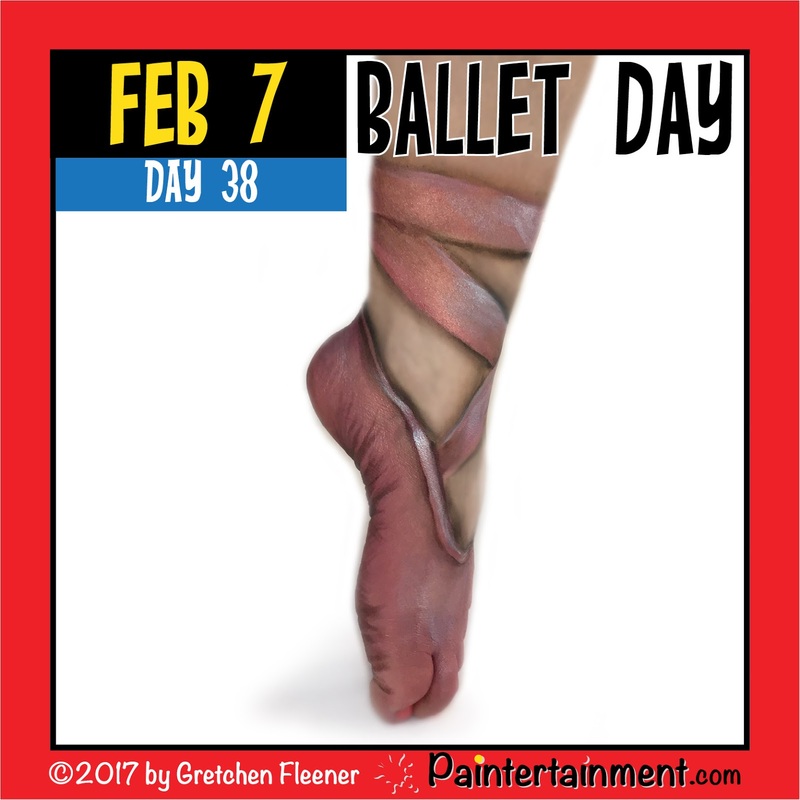 Celebrate Day 38: "Ballet Day!" Happy Ballet Day! This is the closest I will ever come to being a ballerina, haha! And holy cow, it is HARD to paint your own foot!!! I thought Argyle Day was tough...this one was even tougher going all the way around, and onto the foot! 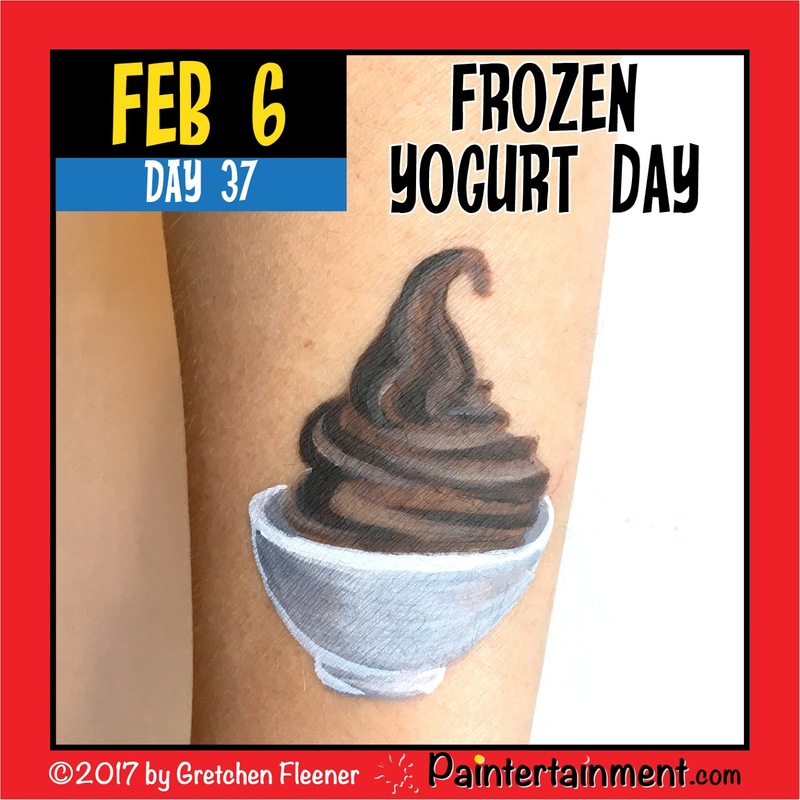 Celebrate Day 37: "Frozen Yogurt Day!" This one isn't overly elaborate, as I didn't have a ton of time to spend on it. But that's kindof the point of this challenge...to paint SOMETHING whether I have a lot of time or not! 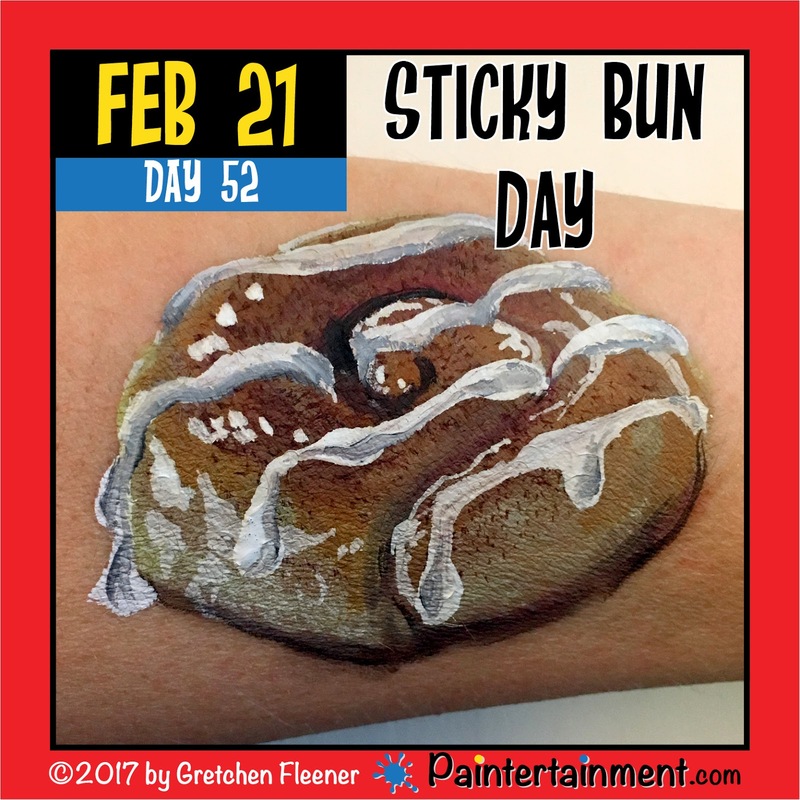 If I always waited until I had an hour to spend on a painting, I'd have already missed out on SO many of these fun daily challenges!! ;-) Now quick, get yourself to the nearest Culver's, STAT!!! Celebrate Day 36: "Chocolate Fondue Day!" 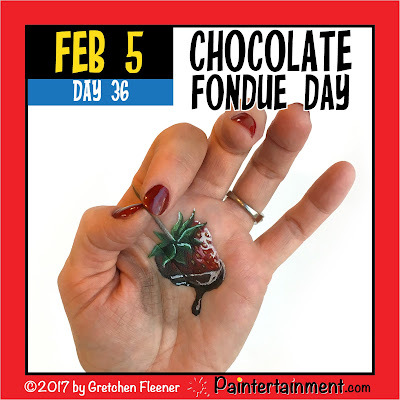 Looking for an excuse to enjoy some chocolate fondue? Look no more! Today is your day! 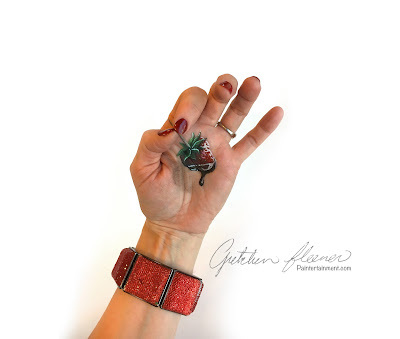 For today I decided to paint a little 3D illusion on the palm of my hand! 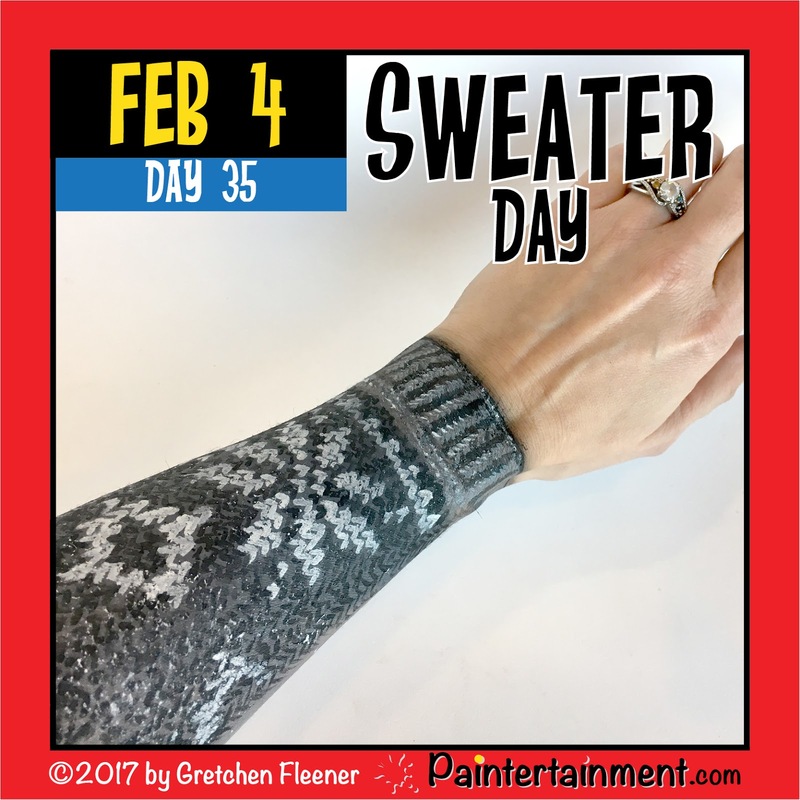 Celebrate Day 35: "Sweater Day!" 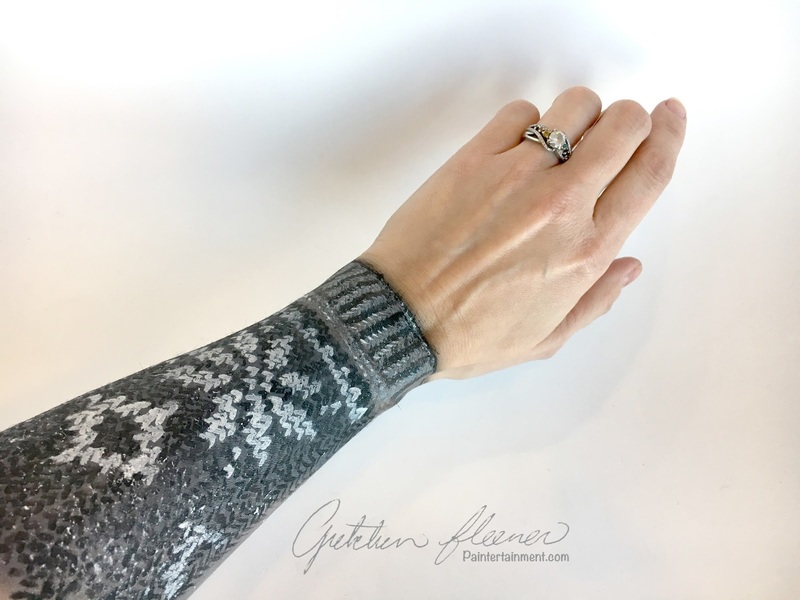 I did a little sweater sleeve for today using black, white and gray! 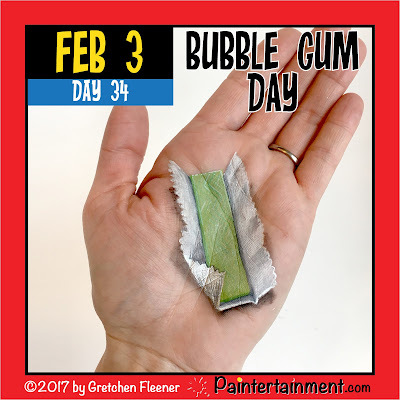 Celebrate Day 34: "Bubble Gum Day!" Okay, so the alternative celebration today is "working naked day." Let's just say that one is not going to happen...I'm pretty sure that while it may increase my business at adult parties, it would certainly end my career doing children's parties! Haha! 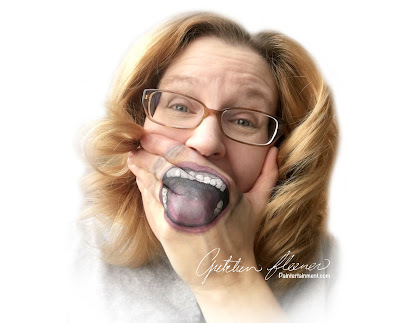 Looking for an entertainer for your party who is guaranteed to arrive fully and appropriately clothed AND with minty fresh breath? Contact me today! Celebrate Day 33: "Hedgehog Day!" 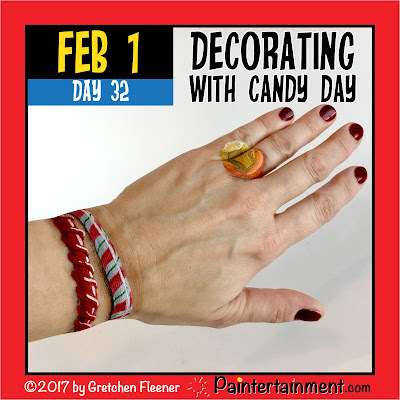 Celebrate Day 32: "Decorating with Candy Day!" Looking for that special something to make your upcoming party extra sweet? 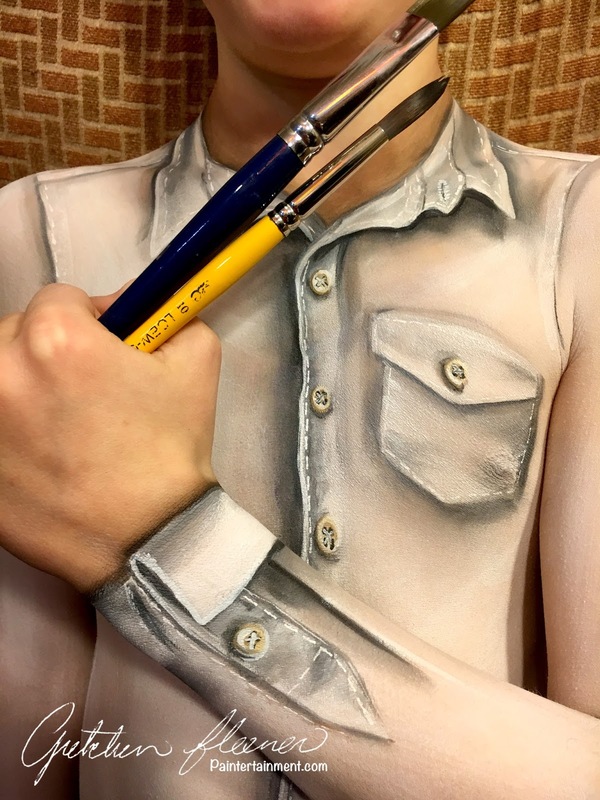 Give Paintertainment a call!